In clinical transplantation host CTL are major effectors of acute rejection, and graft endothelial cells (EC) are major targets of the CTL response. It is unclear what roles CTL will play in pig-into-human xenotransplantation. We compared the mechanisms of killing used by human CTL (huCTL) vs allogeneic and pig xenogeneic EC targets. Both responses show MHC class I restriction of target cell recognition. A granzyme B inhibitor peptide completely blocks anti-human and partially blocks anti-pig responses, while inhibitory Fas ligand Ab only blocks killing of porcine cells despite similar levels of Fas expression in both target cell types. Transduction of Bcl-2 completely protects human EC from huCTL, but has no effect on huCTL-mediated killing of porcine EC despite its efficacy vs drug-induced apoptosis. Bcl-2 effectively protects human EC rendered sensitive to Fas ligand by overexpressing Fas from huCTL, yet fails to protect porcine aortic endothelial cells from huCTL in the presence of anti-Fas ligand Ab. These data reveal differences in the susceptibility of human and porcine targets to huCTL. There is a growing shortage of human organs needed for life-saving transplantation (1). Xenotransplantation could potentially address this problem, and the recent generation of an α1,3-galactosyl transferase knockout pig offers the promise of organs and cells that may be able to evade Ab-mediated hyperacute rejection (2). However, porcine xenografts are likely to be susceptible to T cell-mediated rejection. In clinical transplantation, direct recognition of non-self class I molecules (HLA-A, -B, and -C) on graft endothelial cells (EC)3 by host CD8+ CTL is a major component of acute rejection (3, 4). Previous work from our laboratories established that human CD8+ T cells can directly recognize class I MHC (SLA-I) on porcine EC, suggesting that CTL may pose an important barrier in pig-to-human xenotransplantation as well (5). The present study was conducted to characterize and compare the human CTL (huCTL) response to porcine vs human EC targets. When a CTL engages a target cell there are two major lytic pathways: a contact-dependent pathway involving Fas ligand (FasL)-mediated engagement of Fas (CD95) on the target cell and a granule exocytosis pathway involving release of soluble perforin and granzyme B (6). Most CTL express FasL internally and, after binding a target cell, translocate FasL to the cell surface (7). The cytoplasmic region of Fas contains a death domain that, upon ligand-induced clustering, forms a binding site for an adaptor protein called Fas-associated death domain protein (FADD). FADD, through its death effector domain, can recruit pro-caspase 8 to the complex. Receptor-associated procaspase 8 undergoes autocatalytic activation to caspase 8 (also known as FLICE), which can then cleave and activate effector caspases 3, 6, and 7 at aspartic acid residues. Activated effector caspases cleave a variety of cellular protein substrates, leading to apoptotic cell death. Activated caspase 8 can also cleave a small cytosolic protein called Bid, enabling Bid to bind to mitochondria and to release cytochrome c into the cytoplasm. Released cytochrome c binds to apoptosis-activating factor 1, forming a complex that in the presence of ATP can bind and promote autocatalytic activation of procaspase 9. Caspase 9, like caspase 8, can cleave and activate effector caspases. In some cell types (type 1) sufficient amounts of caspase 8 are activated at the death-inducing signaling complex so as to efficiently initiate apoptosis, whereas others (type 2) form less caspase 8 and must use the mitochondrial pathway to amplify the Fas signal (8). Granzyme B, delivered into a target cell via perforin, can proteolytically activate caspase 8, Bid, and perhaps caspase 3, turning on similar death pathways as Fas ligand. There are several endogenous inhibitors of apoptotic pathways that may influence susceptibility to death signals. Cellular FLICE inhibitory protein (c-FLIP) acts, at least in part, by inhibiting the binding of caspase 8 to FADD, thereby preventing autocatalytic activation (9). There is also a family of proteins called inhibitors of apoptosis (IAPs), including x-linked IAP, cellular IAP-1, cellular IAP-2, and survivin. IAPs can themselves be inhibited by a protein called Smac/DIABLO, which is released from mitochondria by the same signals that release cytochrome c. Once in the cytosol, DIABLO can promote caspase 3 autoactivation by sequestering IAPs that otherwise prevent this from happening. A final level of regulation involves homodimeric Bcl-2 and related proteins (Bcl-xL, A1) that, when present, can block mitochondrial release of cytochrome c and DIABLO. Bcl-2 expression in excess of that of pro-apoptotic members of this family (e.g., Bax or Bad), a condition that favors Bcl-2 homodimer formation, can antagonize the effects of Bid activation and thus antagonize both FasL- and granzyme B-initiated apoptosis in type 2-like cells. One strategy to enhance the success of xenotransplantation is to genetically modify potential donor graft organs or cells such that they are resistant to injury mediated by host lymphocytes. Such cytoprotection could ultimately be provided as gene therapy using viral vectors or transgenic tissue sources. Experiments using anti-apoptotic genes (10, 11), anti-oxidant genes (12, 13), and the IL-10 gene (14) have shown promising results. Previously we have shown that essentially complete cytoprotection of HUVEC from allogeneic CTL killing can be achieved by overexpression of Bcl-2 (15). This observation implied that CTL killing of HUVEC depends upon Bid cleavage and mitochondrial release of cytochrome c and/or DIABLO. In the present investigation we have compared the effects of huCTL on HUVEC with actions on human and porcine aortic endothelial cells (HAEC and PAEC, respectively). We found that Bcl-2 overexpression resulted in significant protection of PAEC from chemical inducers of apoptosis, but no cytoprotection was achieved vs xenogeneic huCTL. This difference appears to be related to species, since HAEC, like HUVEC, are completely protected from huCTL. We also found that porcine, but not human, EC are susceptible to FasL-induced killing. However, differences in the Fas pathway do not fully explain the differences in the effect of Bcl-2. These data suggest that porcine xenografts may be more susceptible than human allografts to huCTL-mediated rejection. PAEC were isolated from porcine aorta, obtained from an abattoir, by gently scraping the luminal surface with a scalpel, and cells were cultured on 0.2% gelatin-coated plastic in DMEM with 20% FBS, 2 mM l-glutamine, 100 U/ml penicillin, and 100 μg/ml streptomycin. The PAEC used in this study were at passages 2–6. All human cells were obtained under protocols approved by the Yale human investigation committee. HAEC were isolated from human aorta by gently scraping the luminal surface with a scalpel and were cultured on 0.2% gelatin-coated plastic in medium 199 with 20% FBS, 50 μg/ml endothelial cell growth supplement (Collaborative Research/BD Biosciences, Bedford, MA), 100 μg/ml heparin (Sigma-Aldrich, St. Louis, MO), 2 mM l-glutamine, 100 U/ml penicillin, and 100 μg/ml streptomycin. The HAEC used in this study were at passages 2–6. HUVEC were isolated by collagenase treatment of human umbilical veins as previously described (16) and were cultured in the medium described above for HAEC. All HUVEC used in these experiments were at passages 2–6. B lymphoblastoid cells lines (BLCL) were generated from cord blood mononuclear cells harvested from the same individual as the HUVEC, by transformation with EBV as previously described (a gift from Dr. G. Miller, Yale Medical School, New Haven, CT) (15) and were cultured in RPMI 1640 in 10% FBS with 2 mM l-glutamine, 100 U/ml penicillin, and 100 μg/ml streptomycin for 4–6 wk. Normal PBMC were obtained from healthy donors by leukapheresis and density gradient centrifugation using lymphocyte separation medium (Organon Teknika, Durham, NC) as previously described (15). PAEC, HAEC, HUVEC, or BLCL (0.5 × 106) were gamma-irradiated (100 Gy) and cocultured with 10 × 106 PBMC isolated in each well of a six-well plate in RPMI 1640 with 10% human AB serum (Irvine Scientific, Santa Ana, CA), 10 U/ml recombinant human IL-2 (Chiron Corp., Emeryville, CA), 2 mM l-glutamine, 100 U/ml penicillin, and 100 μg/ml streptomycin. Cocultures were fed with fresh medium containing 10 U/ml IL-2 after 3 days and restimulated weekly with gamma-irradiated (100 Gy) PAEC, HAEC, HUVEC, or BLCL in medium containing 10 U/ml IL-2 at a ratio of stimulator/responder of 1/20. Human CTL against porcine and human vascular EC were generated by repeated weekly stimulation of human PBMC with PAEC, HAEC, HUVEC, or BLCL for 4–5 wk. The resultant cells were tested directly for CTL activity as described below. The EcoRI-excisable enhanced green fluorescence protein (EGFP) DNA insert was subcloned from LZRSpBMN-EGFP into the pBMN-Z-I-Neo retroviral vector. The D34A caspase-resistant form of Bcl-2 DNA in the pSG5 expression vector (17) was provided by Dr. M. Hardwick (The Johns Hopkins School of Public Health, Baltimore, MD), and the 800-bp cDNA insert was isolated by PCR and subcloned into the pCRII vector. The EcoRI-excisable Bcl-2 DNA insert was subcloned into the pBMN-Z-I-Neo retroviral vector (provided by Dr. G. P. Nolan, Stanford University, Stanford, CA). The NotI-excisable FasL DNA insert was subcloned into the pBMN-Z-I-Neo retroviral vector. The EcoRI-excisable Fas DNA insert was subcloned from pCI vector into pBMN-Z-I-Neo retroviral vector. The retroviral vector DNA containing EGFP, the caspase-resistant form of Bcl-2, human FasL, and human Fas DNA were directly transfected into the PA317 packaging cell line by Lipofectamine 2000 (Invitrogen, Carlsbad, CA), and G418-resistant cells were derived, which served as the source of retroviral stocks. PAEC, HAEC, or HUVEC were infected with retroviral vectors in the presence of polybrene (8 μg/ml) for 6 h, and then fresh normal medium was replaced. At 48 h after infection the cells were cultured in medium containing 1 mg/ml G418. After a 2-wk incubation, at least 95% of the cell line expressed the appropriate transduced gene by FACS using the appropriate Ab. In some experiments a second or even a third infection was performed to increase the effectiveness of the retroviral transduction. The expression of Bcl-2, FasL, and Fas on PAEC, HAEC, and HUVEC and perforin on human CTL was measured by indirect immunofluorescence flow cytometric analysis using a FACScan (BD Biosciences, Mountain View, CA) flow cytometer and CellQuest software. For detection of Bcl-2 and perforin expression, EC were fixed with 4% paraformaldehyde for 10 min at room temperature and washed twice. Cells were permeabilized in PBS with 0.1% saponin (Sigma-Aldrich) and 1% BSA for 10 min at room temperature and then incubated with anti-human Bcl-2 mAb (clone 124; DAKO, Carpinteria, CA) or anti-human perforin mAb (BD PharMingen, San Diego, CA) in PBS with 0.1% saponin for 60 min at room temperature. A nonbinding IgG mAb (Jackson ImmunoResearch Laboratories) was used as an isotype control. Cells were then washed twice with PBS with 0.1% saponin and incubated with R-PE-conjugated donkey anti-mouse IgG (1/100; Jackson ImmunoResearch Laboratories) in PBS with 0.1% saponin for 30 min at room temperature. After incubation, cells were washed twice, suspended in 0.5 ml of PBS, and analyzed using a FACScan flow cytometer and CellQuest software. Detection of FasL and Fas proteins on EC was conducted with anti-human FasL or Fas mAb using the same procedure described in the absence of saponin. Cell death in response to agents other than huCTL was measured by two different assays: Hoechst staining of DNA to quantify residual viable (adherent) cells or propidium iodide (PI) staining of permeabilized cells followed by FACS analysis to quantify the fraction of hypodiploid cells. For Hoechst dye staining, EC were plated at 2 × 104 cells/200 μl of culture medium in 96-well, flat-bottom plates coated with 0.2% gelatin. EC were then incubated overnight with vehicle, staurosporine (Calbiochem, La Jolla, CA), actinomycin D, or FasL-Fc (800 μg/ml) plus 1.5 μg/ml mouse IgG as a cross-linker (Upstate Biotechnology, Lake Placid, NY). Resistant EC, which remained attached to the wells, were rinsed twice in PBS to remove dead cells, and the remaining adherent cells were incubated in 70% ethanol containing 100 μg/ml Hoechst 33258 (Molecular Probes, Eugene, OR) for 30 min at room temperature. Each well was then rinsed twice with PBS, and the retained fluorescence was quantified in a fluorescence plate reader (PerSeptive Biosystems, Framingham, MA). For PI staining of permeabilized cells, PAEC-EGFP, PAEC-FasL, HUVEC-EGFP, or HUVEC-FasL were plated at 3.5 × 105 cells/3 ml in six-well plates coated with 0.2% gelatin. After 24-h incubation, both attached and detached cells were collected, permeabilized with 70% ethanol for 30 min, and washed twice with cold PBS. Cells were then resuspended in PBS with 1 mg/ml of RNase A and 50 μg/ml of PI (Roche, Indianapolis, IN), incubated at 4°C for 30 min in the dark, and analyzed by flow cytometry. The number of cells expressing <2n were scored as hypodiploid and normalized to the total population to determine the percentage of death. Target cell lysis was assessed by a calcein fluorescence release assay as previously described (15). The target cells were plated at 2 × 104 cells/200 μl in 96-well, flat-bottom plates coated with 0.2% gelatin and incubated overnight. Cells were then incubated with 50 μM calcein-AM (Molecular Probes) in medium 199 with 5 mM HEPES for 30 min at 37°C and washed twice with medium 199 with 5% FCS, 5 mM HEPES, 2 mM l-glutamine, 100 U/ml penicillin, and 100 μg/ml streptomycin. Effector cells from bulk culture or purified CD8+ T cells were washed once, added at various E:T cell ratios to calcein-loaded HUVEC targets at 200 μl/well in triplicate, and incubated at 37°C. After a 4-h incubation, retained calcein was measured using a fluorescence multiwell plate reader (Cytofluor2; PerSeptive Biosystems; excitation wavelength, 485 nm; emission wavelength, 530 nm). The percent specific killing was calculated as: (maximal retained − retained sample)/(maximal retained − spontaneous retained) × 100. For CTL assays with anti-MHC class I mAb (W6/32), anti-MHC class II mAb (BD PharMingen), and anti-SLA class I and anti-SLA class II (VMRD, Pullman, WA), the Ab were preincubated with target cells for 1 h before the CTL assay. For CTL assay with anti-CD4 mAb, anti-CD8 mAb, anti-FasL mAb (clone NOK-2), and anti-Fas mAb (clone DX2) (BD Phar-Mingen), the Ab were added during the 4-h CTL assay. For CTL assay with the granzyme B inhibitor zAla-Ala-Asp-CH2Cl (zAAD; Enzyme Systems Products, Livermore, CA), effector cells were preincubated with various concentrations of inhibitor for 1 h. For the Concanamycin A (Sigma-Aldrich) experiment, effector cells were preincubated with various concentrations of Con A, ranging from 250 nM to 1 μM, for 2 h.
HuCTL lines were generated against PAEC, HAEC, HUVEC, or human BLCL by repeated stimulation of human PBMC with irradiated stimulator cells as described in Materials and Methods. To characterize their specificity, these huCTL were tested against different targets cells (Fig. 1⇓). PAEC-stimulated huCTL killed only PAEC from the same animal used in the initial stimulation, but not unrelated PAEC or HUVEC. 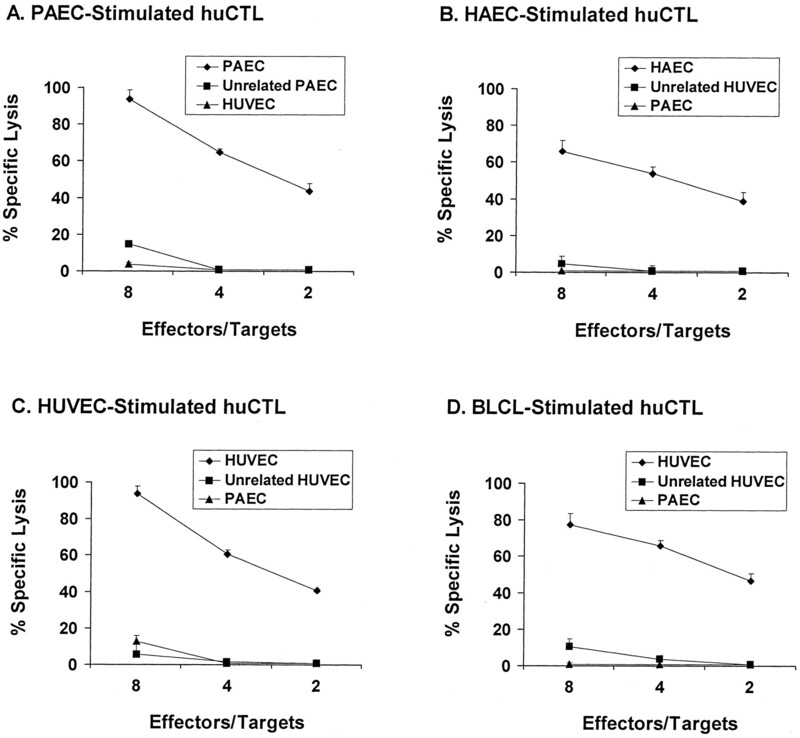 HAEC-, HUVEC-, or BLCL-stimulated huCTL showed restricted allo-specificity against the HAEC, HUVEC, or BLCL used for stimulation, but not against unrelated targets (Fig. 1⇓). In Ab blocking experiments, these huCTL cytolytic activities against porcine or human EC were inhibited by species-appropriate anti-MHC class I and anti-human CD8 mAb, but not by anti-MHC class II and anti-CD4 mAb, demonstrating that human anti-porcine or anti-human EC CTL cytolytic activities are MHC class I restricted and are mediated by CD8+ effector cells (data not shown). The phenotypes of the various huCTL generated using human or porcine stimulators appeared similar. Specifically, all the huCTL examined expressed similar levels of perforin, detected by intracellular FACS, and FasL, assessed by Western blot analysis (data not shown). PAEC-stimulated huCTL are xenospecific, and HAEC-, HUVEC-, and BLCL-stimulated huCTL are allospecific. HuCTL against porcine and human EC were generated by multiple stimulation of human PBMC with PAEC, HAEC, HUVEC, or BLCL for 4–5 wk. CTL assays were performed in the presence of related or unrelated EC as targets and with E:T cell ratios of 4, 8, and 10. The experiment shown is representative of three similar experiments. To examine the mechanism of killing, inhibitor studies were performed using a granzyme B inhibitory peptide, z-AAD (see Fig. 2⇓), and Concanamycin A, a vacuolar ATPase inhibitor known to inhibit perforin-dependent lysis (data not shown) (18). Both inhibitors effectively blocked huCTL-mediated killing of all targets tested in a dose-dependent fashion. However, at the highest E:T cell ratio, the highest inhibitor concentrations did not completely block cytolysis of PAEC. Blocking studies with an anti-FasL mAb showed that xenoreactive CTL were partially inhibited by anti-FasL Ab, while killing by alloreactive huCTL stimulated by HAEC, HUVEC, or BLCL was completely resistant to anti-FasL mAb (see Table I⇓). These findings suggest that both allo- and xenoreactive huCTL use a perforin-granzyme B pathway, and that the Fas-FasL pathway also contributes to the function of xenoreactive huCTL, but is not a significant contributor to lysis of allogeneic human EC targets. Xeno- and alloreactive huCTL are sensitive to granzyme B inhibitory peptide. HuCTL were preincubated with various concentrations of the granzyme B inhibitor zAAD for 1 h. CTL assays were performed with E:T cell ratios of 4, 8, and 10. The experiment shown is representative of three similar experiments. The results using the anti-FasL Ab could imply that huCTL stimulated by allogeneic human cells provide a defective FasL signal, that porcine EC are more susceptible to FasL than are human EC, or that human cells are so much more susceptible to a perforin-granzyme pathway that the FasL pathway is redundant. Since all huCTL displayed similar levels of FasL, and since human targets were more fully protected than PAEC by a granzyme B inhibitor, we focused our efforts on studying the differences between EC responses to human FasL. The levels of endogenous Fas expression on PAEC and HUVEC, as determined by Western blotting, are roughly equivalent (Y. Bai and G. Tellides, unpublished observations). To assess functional differences in the Fas pathway between HUVEC vs PAEC, we cocultured target cells with HUVEC transduced to express human FasL via a retrovirus. After 2 days of coculture the cells were stained with PI to assess cell death (see Table II⇓). The control cells, HUVEC-FasL, HUVEC, and PAEC, showed a low level of PI staining. Coculture of HUVEC with HUVEC-FasL did not significantly increase the level of PI staining, but a substantial increase in PI staining was observed when PAEC were used as targets (25.8 or 10.3%). In Expt. 2, the inclusion of anti-FasL Ab was able to block cell death when PAEC and HUVEC-FasL were cocultured. These results show that the membrane form of FasL is capable of inducing cell death on PAEC, but not HUVEC, under these experimental conditions. These results are in agreement with other published studies that indicated that the Fas pathway is deficient in HUVEC (19, 20) and explain the differential ability of anti-FasL Ab to protect human and porcine EC from huCTL. Previously we have observed that overexpression of a caspase-resistant form of Bcl-2 in HUVEC results in marked cytoprotection from alloreactive huCTL (15). To compare the effects of Bcl-2 overexpression in PAEC, HUVEC, and HAEC, all cells were transduced with a selectable retroviral vector expressing caspase-resistant Bcl-2. As judged by intracellular staining and FACS analysis, >95% of the drug-selected cells expressed Bcl-2, and all EC expressed similar levels of Bcl-2 protein (data not shown). 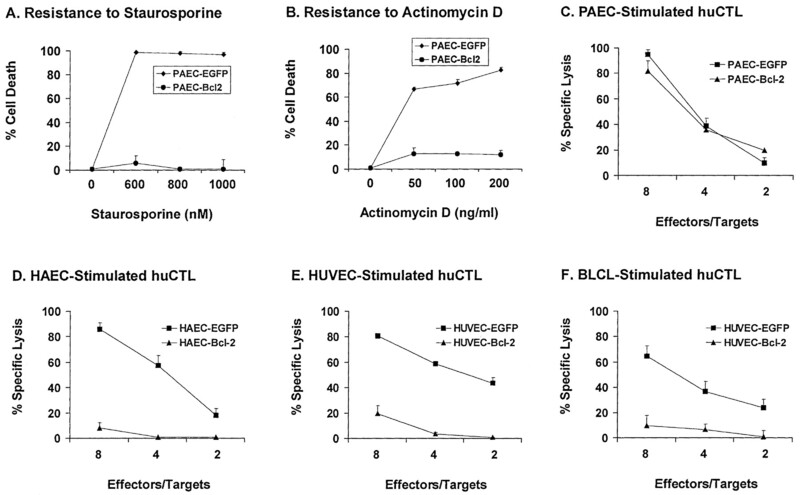 PAEC expressing Bcl-2 were resistant to apoptotic cell death induced by staurosporine and actinomycin D (see Fig. 3⇓, A and B) and other chemical inducers of apoptosis (data not shown). Strikingly, the cells remained fully sensitive to xenoreactive huCTL (Fig. 3⇓C). In contrast, all human cell targets tested, showed significant cytoprotection by Bcl-2 against huCTL (Fig. 3⇓, D–F). Bcl-2 expression protects human EC, but not porcine EC, from huCTL. Bcl-2-transduced PAEC monolayers were treated with staurosporine (A) or actinomycin D (B) for 24 h. Cell death was then measured by Hoechst 33258 stain with attached cells. C–F, CTL were cocultured with Bcl-2- or EGFP-transduced target cells with E:T cell ratios of 4, 8, and 10. The experiment shown is representative of three similar experiments. While PAEC differ from human EC in that they are susceptible to killing by FasL, and they cannot be protected from huCTL by overexpression of Bcl-2, the relationship between these phenomena is unclear. To investigate this connection, human EC were transduced with a retroviral vector expressing human Fas as well as EGFP. HUVEC normally express low levels of endogenous Fas, while >95% of the transduced HUVEC expressed high levels of Fas protein (data not shown). HUVEC expressing high levels of Fas became susceptible to a FasL-Fc fusion protein in the presence of anti-Ig cross-linking (data not shown). 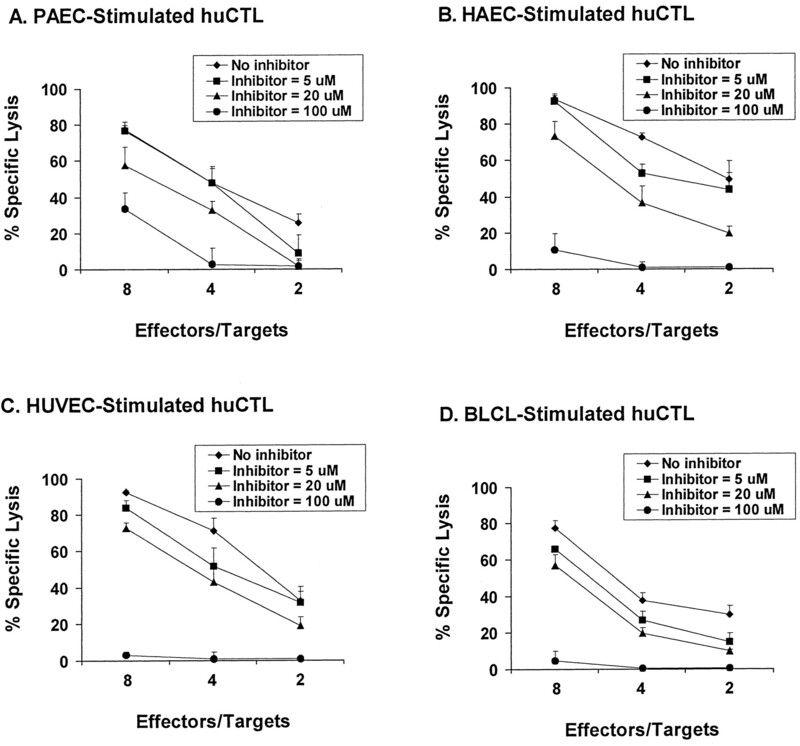 Strikingly, Fas and Bcl-2 doubly transduced HUVEC were as resistant to huCTL as HUVEC singly transduced with Bcl-2 (Fig. 4⇓A). Thus, Bcl-2 can antagonize the apoptosis induced by the FasL pathway in Fas-transduced HUVEC, and Bcl-2 protection of human EC cannot be explained by the absence of a functioning Fas pathway. In a final series of experiments, the capacity of anti-Fas ligand mAb to protect Bcl-2-transduced PAEC was examined. The combination of anti-FasL mAb and Bcl-2 was not able to protect PAEC from CTL any better that anti-FasL Ab alone (see Fig. 4⇓B). These data suggest that PAEC, in contrast to human cells, express a FasL-independent death pathway, which is likely to involve perforin and granzyme B, that is resistant to Bcl-2. Bcl-2 protects human EC, but not porcine EC, against FasL-induced cell death mediated by huCTL. A, CTL assays were conducted with HUVEC target cells expressing Fas protein. B, CTL assays were performed in the presence or the absence of anti-FasL Ab at 20 μg/ml. The E:T cell ratio for both CTL assays is 4. The experiment shown is representative of three similar experiments. In these studies we have established conditions for routinely generating highly efficient xenogeneic huCTL from human PBMC by coculture with PAEC. These effectors appear to be restricted by porcine MHC class I molecules. We have used these huCTL lines to compare the mechanisms of lysis of porcine and human EC by CTL and found that PAEC targets differ from human EC targets in two ways: unlike human EC, PAEC are susceptible to FasL, and PAEC cannot be protected from huCTL by overexpression of Bcl-2. On the face of it, the enhanced susceptibility of PAEC to human FasL is surprising. In general, interactions across xenogeneic barriers involve loss of function because homologous members of receptor-ligand pairs are sufficiently divergent in their structures to be unable to interact. In this instance we have seen a gain of function. Although we have not been able to directly measure porcine Fas on the PAEC cell surface due to a lack of access to an Ab suitable for FACS analysis, it is unlikely that Fas levels, which are similar in human and porcine EC by Western blot, are sufficient to account for this difference. Instead, we favor a model in which engagement of Fas on PAEC generates a stronger death signal. Differential sensitivity to Fas-mediated apoptosis has lead to the classification of cells as type I or type II based on whether Bcl-2 can inhibit cell death. By this criterion, PAEC appear to have the properties of type I cells that cannot be protected by Bcl-2. In contrast, HUVEC that have been rendered sensitive to FasL by transduction of Fas resemble type II cells, since they can still be protected from CTL by Bcl-2. However, Bcl-2 protection of HUVEC-Fas was not completely effective against killing by FasL-Ig fusion protein (L. Zheng and A. M. Bothwell, unpublished observations). The differences in susceptibility of PAEC and transduced human EC to FasL may be qualitative. Recently, we have found that pretreatment of HUVEC with IFN-γ can render HUVEC partly susceptible to FasL (20). The fact that PAEC are susceptible without IFN-γ treatment is pertinent for xenotransplantation, since human recipients of porcine organs are unlikely to produce pig IFN-γ, and human IFN-γ is not active in pig cells. In addition to Fas, the death-inducing signaling complex assembled by FasL binding includes FADD, c-FLIP, and caspase 8. Variations in the sensitivity to FasL-triggered cell death have been attributed to levels of c-FLIP expression (21). There are two splice variants of c-FLIP, with the longer form being a more effective inhibitor of caspase 8. The long isoform has high homology with caspase 8, containing two death domains and a nonfunctional caspase-like domain. It can bind caspase 8 and form a heterodimer, thus preventing autocatalytic activation of caspase 8 molecules that occurs in trans within pro-caspase 8 homodimers bound to FADD. The importance of c-FLIP is best demonstrated in fibroblasts derived from knockout mice, which show hypersensitivity to FasL (22). The level of pro-caspase 8 in the cell may also be important in the regulation of this pathway. HUVEC that are made sensitive to FasL by IFN-γ treatment increase pro-caspase 8 levels as well as Fas levels, but, on the other hand, show no drop in FADD or c-FLIP (20). Katoaka et al. have argued that the level of c-FLIP is more significant for determining sensitivity, because the affinity of c-FLIP is higher than that of caspase 8 for the Fas-FADD complex (23). Unfortunately, we have not been able to directly compare the levels of c-FLIP or caspase 8 between human and porcine EC because of a lack of pig-specific reagents. In these studies inhibitors of the perforin/granzyme B pathway could protect both porcine and human EC from huCTL. It should not be assumed that these pathways are equivalent in both cell types, because Bcl-2 could not protect PAEC even in the presence of anti-FasL Ab. This observation suggests that there may be a granzyme B-dependent pathway in PAEC that confers the Bcl-2-resistant CTL activity. One possibility is that PAEC express much higher levels of either an initiator or an effector caspase than do human EC. If this were true, then killing in PAEC could be initiated by direct granzyme B activation of a caspase substrate (a type I-like response) rather than through activation of Bid. The identification and inhibition of this pathway could be used in conjunction with Bcl-2 overexpression as a useful strategy to enhance the survival of xenotransplanted porcine cells or organs in a human host. Retroviral vectors and packaging cell lines were obtained from Dr. Garry Nolan at Stanford University. We also wish to thank George Tellides and Nancy Kirkiles for providing the HAEC and Louise Camera-Benson and Gwendolyn Davis in the Boyer Center for Molecular Medicine Tissue Culture facility for providing HUVEC. ↵1 This work was supported by National Institutes of Health Grants HL51448 (to A.L.M.B.) and HL62188 (to J.S.P.) and National Research Scientist Award HL10461 (to L.Z.). ↵3 Abbreviations used in this paper: EC, endothelial cell; BLCL, B lymphoblastoid cells line; c-FLIP, cellular FLICE inhibitory protein; EGFP, enhanced green fluorescence protein; FADD, Fas-associated death domain protein; FasL, Fas ligand; HAEC, human aortic endothelial cell; huCTL, human CTL; IAP, inhibitor of apoptosis; PAEC, porcine aortic endothelial cell; PI, propidium iodide; zAAD, zAla-Ala-Asp-CH2Cl.